Are you rebuilding a plant or are you thinking about repowering and retrofitting? Are you looking for a tool to plan, design and optimize your power plant? If it can predict the degree of efficiency and behavior in any operating situation, the better? Then you are right with us, because the right software for your needs is only available from STEAG. We are developer, monitoring center and sole supplier of EBSILON Professional. The innovative system with its functional additional modules is based on the modeling of thermodynamic cycle processes and evaluates them reliably with regard to efficiency and partial load behavior. It maps new and existing circuits of power engineering plants, including conventional power plants, nuclear and solar power plants, desalination plants and fuel cell applications. The great strengths of EBSILON Professional lie in the open and transparent software structure and the extremely fast calculation of the system parameters. Convenient analysis and presentation of results. Intuitive modeling with graphical user Interface. Comprehensive component and material data libraries are available. Intelligent fault analysis and online help. Open software architecture and powerful Interfaces. VTU continuously works with gas turbine vendors to grow the Gas Turbine Library to become a valuable and ‘living’ source for gas turbine performance information, so that engineers around the globe can make use of reliable and first-hand data to analyze and improve combined cycle plants. 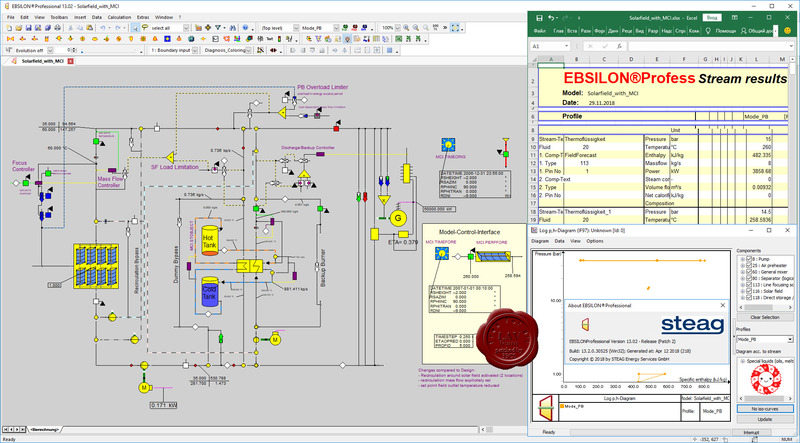 The VTU Energy Gas Turbine Library works in conjunction with the EBSILON Professional heat balance software by STEAG Energy Services GmbH. Individual equipment characteristics in design and off-design mode. Full record of all gas, water/steam and electrical flows of the plant. Flexibility in equipment arrangement, plant configuration and mix of technologies. A powerful, fast and reliable equation-based solver. Open architecture to include user-defined models for new technology or vendor data. A state-of-the art graphical user interface and a wide variety of output options in graphical and tabular formats and an interface to Microsoft Office Excel.